Inspection, testing, and maintenance of fire protection systems are comprehensive procedures. When completed, the fire safety procedures confirm that all system components are in good condition and will ensure the system’s successful operation. To refine fire system evaluation methods and frequency, the Office of the State Fire Marshall has made major amendments to the automatic fire extinguishing systems maintenance protocol found in Title 19, Division 1, of California Code Regulations. The amendments for fire safety and protection incorporate, by reference, the National Fire Protection Association Standard for the Inspection, Testing and Maintenance of fire protection systems, and to require the use of the newly designed AES 1-9 forms for the reporting of fire system evaluation results. Hose Houses—to confirm there is no physical damage or missing equipment and to ensure proper accessibility. 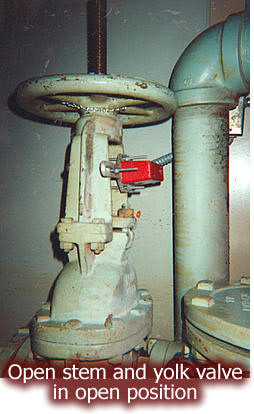 Control Valves—to verify that all valves, including valves secured with locks or electrically supervised, are in the normal open or closed position, are properly sealed, locked, supervised, provided with appropriate wrenches and identification, free from external leaks, and accessible. Backflow Preventers—The double check assembly valve, and the double check detector assembly valve shall be inspected to ensure that the OS&Y isolation valves are in the normal open position. Reduced pressure assemblies and reduce pressure detector assemblies shall be inspected to ensure that the differential sensing valve relief port is not continuously discharging. 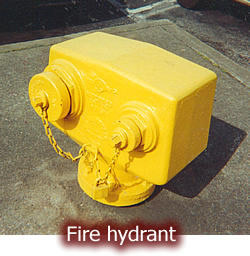 Hydrants—dry/wet barrel and wall hydrants shall be inspected with necessary corrective action. Any inaccessible hydrants shall be made accessible. Water or ice found in a hydrant barrel (possibly indicating a faulty drain, or a leaky valve, or high groundwater table, which could make it necessary to plug the drain and pump out the barrel after each use) shall be drained and repairs made, including to the drain itself if improper drainage is discovered. For any leaks found in outlets or at the top of the hydrant, gaskets, packing, or other required parts shall be repaired or replaced. 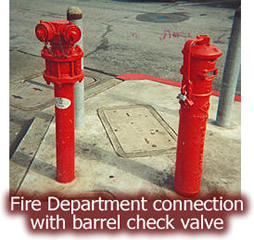 Cracks, worn nozzle heads, a worn hydrant operating nut, or missing wrench shall be repaired or replaced. Outlets shall be lubricated and tightened as necessary. Mainline Strainers—shall be removed and inspected for failing, damaged, and corroded parts with necessary corrective action. Plugging or fouling shall be cleaned and any corrosion shall be replaced or repaired. Hose Houses—to make accessible if inaccessible, to repair or replace any physical damage, to replace any missing equipment. Any other corrective action deemed necessary shall be taken. Piping—Generally, underground piping cannot be inspected on an annual basis but a flow test shall be conducted every 5 years. (See piping below for more information.) Exposed piping shall be inspected for leaks, physical damage, and/or corrosion to ensure that proper restraint methods are in good condition. Any necessary corrective action shall be taken. Piping installed in areas that are inaccessible for safety considerations shall be inspected during a scheduled shutdown. Monitor Nozzles—to ensure proper function all monitor nozzles shall be oscillated and moved throughout their full ranges to ensure proper operability. Monitor nozzles that are mounted on hydrants shall also be inspected. Hydrants—to ensure appropriate function, each hydrant shall be opened fully and waterflowed until all foreign material has cleared. Water flow shall not be maintained for less that one minute. After operation, dry barrel and wall hydrants shall be observed for proper drainage. Full drainage shall not take longer than 60 minutes. Where soil conditions or other factors are such that the hydrant barrel does not drain within 60 minutes, or where the ground water level is above that of the hydrant drain, the hydrant drain shall be plugged and the water in the barrel shall be pumped out. Dry barrel hydrants that are located in areas subject to freezing weather and that have plugged drains shall be identified clearly as needing pumping after operation. Backflow Preventer Assemblies—all backflow preventers installed in fire protection system piping shall be tested in accordance with the following: 1) A forward flow test shall be conducted at the system demand, including hose stream demand, where hydrants or inside hose stations are located downstream of the backflow preventer. 2) A backflow performance test, as required by the authority having jurisdiction, shall be conducted at the completion of the forward flow test. For backflow preventers sized 50.8 mm (2 in.) and under, the forward flow test shall be acceptable to conduct without measuring the flow where the test outlet is of a size to flow the system demand. Supervisory—A distinctive signal shall indicate movement from the valve’s normal position during either the first two revolutions of a hand wheel or when the stem of the valve has moved one-fifth of the distance from its normal position. The signal shall not be restored at any valve position except the normal position. Monitor Nozzles—Inspection with required corrective action to repair any found leakage, repair or replace physical damage, clean or replace corrosion, lubricate and protect as necessary. Piping—Underground and exposed piping shall undergo a flow test to determine if the internal condition of the piping is in good working order. Flow tests shall be made at flows representative of those expected during a fire for the purpose of comparing the friction loss characteristics of the pipe with those expected for the particular type of pipe involved, with due consideration given to the age of the pipe and to the results of previous flow tests. Where there are no means to conduct full flow tests, tests generating the maximum available flows shall be performed. Any flow test results that indicate deterioration of available water flow and pressure shall be investigated to the complete satisfaction of the authority having jurisdiction to ensure that the required flow and pressure are available for fire protection. Piping installed in areas that are inaccessible for safety considerations due to process operations shall be inspected during a scheduled shutdown. Pressure Regulating Valve—a full flow test shall be conducted on each valve and compared to previous test results, any adjustments shall be made in accordance with the manufacturer’s instructions. Fire Department Connection—at full flow we will perform a fire inspection back flush. Call us today to schedule your Fire Hose and Private Yard Hydrant Safety Inspection!